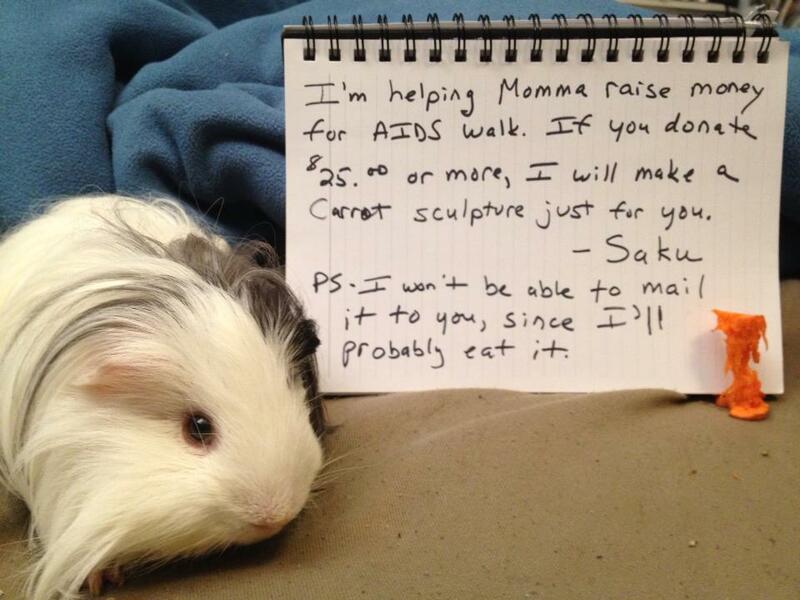 Saku was a sweet, gentle pig and an absolute trooper. That’s what Mummy says, anyway. He was Auntie Dawn’s first piggie and he went to the Rainbow Bridge very suddenly in 2013, just after doing an appeal for Auntie Dawn’s charity fundraising event. He was a Sheltie, like Humphrey, but white, with some dark markings. He was very elegant. He and Mariusz lived together and had lots of adventures – well Saku watched while Mariusz had the adventures. Saku became a celebrated sculptor, even though Mummy cast him as the wild-haired scientist in her books. Saku’s 2013 appeal for the AIDS walk can be repeated here, since Auntie Dawn would really like to raise lots of money for AIDS charities in the New York Charity walk on May 17th 2015. You can donate to her fundraising by clicking this link. I just don’t think we can send you a carrot sculpture this year. Thank you so much, Dyl. This is a little hard for me to read. I’m crying now, but it’s a lovely tribute. Thank you also for plugging my AIDS Walk fundraising. A photo very similar to the one on the right, S sleeping, is the opening screen on my iPhone. It has been for years now, and I don’t think I’ll ever change it. He was our first, and we didn’t know what to expect when we got him. I remember carrying him home in a shoebox. He was so nervous that he made copious piddle and poop. We learned along with him, and he soon settled in to become the charming sheltie we all knew and loved. I like to think that, before he was born, he was a gentle little spirit just floating around. He decided to come to earth for a while, and found Momma. Then he went back to the spirit world. I hope he’s hanging around me right now, and keeping watch over his little brothers and even those feathery dingdongs. I wouldn’t be surprised if he visited you. If you see him, tell him I love him, ok? Saku looks like he was an amazing spirit. Elegant is definitely the word I would have used. I’m so sorry to hear he left so quickly.